Christmas is just around the corner. Presents are wrapped (hopefully), tree is decorated and you are sipping on some holiday cheer. But, what about those holiday side dishes? Typically, we reserve the turkey for Thanksgiving Day, and serve another meat, like ham or prime rib, for Christmas Dinner. Whatever your routine may be, it’s easy to get into a holiday rut. Rest assured, I’ve got you covered with a few classic Southern Christmas staples and other side dishes from my favorite food bloggers. If you are looking to shake up the holiday rotation or need additional side dishes for extra guests, check out the round-up below. Let’s be real for a second. Generally, it’s not the main course that makes a meal so memorable. Maybe it’s just me, but I LOVE side dishes. I could make a meal out of them alone. Kentucky Bourbon Cranberry Sauce: It’s tangy, sweet and bourbon is a main ingredient. It’s the perfect accompaniment to the savory, classic holiday meal. Cornbread Dressing: This Cornbread Dressing recipe is a longtime staple in our house. My grandmother used to make this for Thanksgiving and Christmas, using a Southern Cornbread Recipe. It’s a holiday favorite in our home. Breakfast Casserole: If you are hosting a crowd for the holidays (or any other time), prepare this the night before, then pop it in the oven for a hot breakfast that will feed a house full! Cheesy Potato Casserole from Mom’s Dinner: No need for fancy kitchen skills with this recipe. All you need is to chop, stir and have a love for cheese and potatoes. This side dish would go with any holiday meal – traditional or otherwise. Roasted Brussels with Bacon & Cranberries from Mom’s Dinner: For those who do not like Brussels Sprouts, you may be able to convince them with bacon. Add cranberries for a festive feel. The crispy, salty and sweet combo will be a hit at the table! Raspberry Jello Fluff from Mom’s Dinner: I was pretty sure I was the only Jello Fluff loving person left on the planet, but Mom’s Dinner proved me wrong. Jello Salads are a trip down memory lane for so many. Serve in retro Trifle Bowls or goblets for an extra dash of nostalgia. 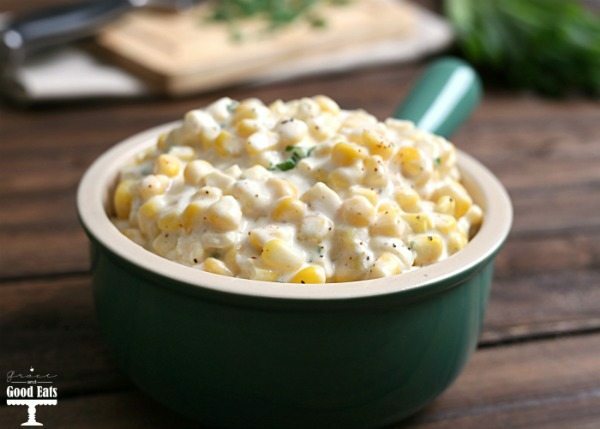 Creamed Corn from Grace and Good Eats: Tis the season to indulge! This creamed corn recipe is the perfect balance of creamy, spicy goodness, and totally worth the indulgent factor! Roasted Sweet Potatoes with Honey and Cinnamon from Kroll’s Korner: I’ve never been a fan of sweet potatoes smothered with marshmallows, but I do love sweet potatoes. 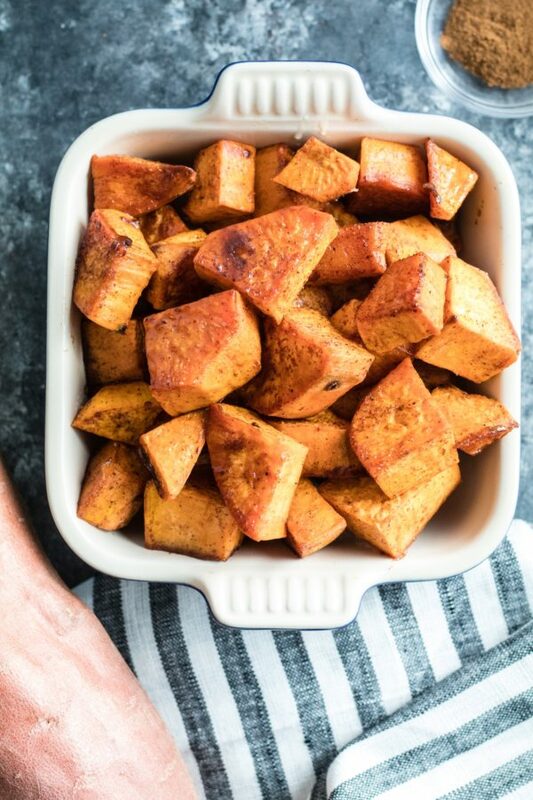 Kroll’s Korner whipped up roasted sweet potatoes with honey, nutmeg and cinnamon a tasty side dish for your holiday table. Got any other favorites? Leave me your links and ideas below. Great side dish ideas! Can’t wait to start cooking. What an amazing round up. This will definitely help me in my Holiday planning. What a yummy round up- there’s no way to choose!